This qualification aims to provide learners with the skills and knowledge necessary to plan, deliver and evaluate safe and effective fitness instruction sessions via the context of gym-based exercise. 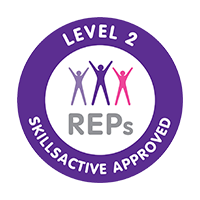 Learners successfully completing this qualification will be able to gain access to the Register of Exercise Professionals (REPs) at level 2. Learners successfully completing this qualification will be able to gain access to the Register of Exercise Professionals (REPs) at level 2. The qualification will help learners to find employment in the fitness industry and also help enhance the status of employees already within the fitness industry. It aims to promote good practice in fitness instructing by working to a common standard which is nationally recognised. WHAT WILL THIS QUALIFICATION COVER? Can I do a face-to-face assessment? In additon to our training days we also offer a face-to-face assement at our FitLearn headquarters. This is perfect for student looking to get qualified quickly and aren't comfortable video recording their practical assessment. Please remember that this is a completely optional extra! All awarding bodies charge registration and certification fees. At present the Level 2 Certificate in Fitness Instructing is £80. Our Awarding Organisation for these qualification is NCFE. They have been established for 170 years, and last year alone over 340,000 learners from over 2,000 colleges, schools and training organisations chose NCFE as the Awarding Organisation to help them move their careers forward. These are regulated qualifcations* and are also endorsed by REPs and CIMSPA meaning you can join both REPs at Level 2 and CIMSPA and gain access to other benefits such as discounted insurance.